In this magical kingdom, life is all rainbows and unicorns with our Unicorn Bounce House rental. This rainbow colored bounce house features all of our magical pony friends and will be sure to provide hours of fun! All your little bouncers will love bouncing around the large 13x14 bounce house area. Feel safe when your little ones bounce on this inflatable rental: this bounce house has many safety features, including finger-safe mesh windowed walls around the bounce house so you can better supervise your little jumpers and an enclosed bounce house roof with safety egress port. This bounce house also includes an excellent entrance safety tunnel, helping to ensure that your little ones enter/exit the bounce house safely. Bring the Unicorn Bounce House to your next event and watch your guests leave with a smile and sparkle in their eye. Safety is our top priority, above everything, EVEN FUN (sorry, kids!). 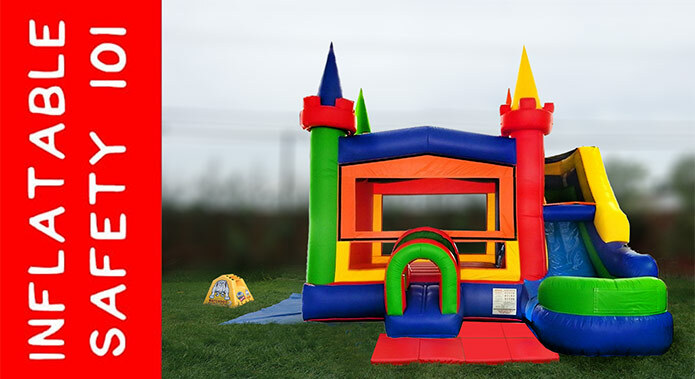 This bounce house rental includes a Watchdog Series 2 Blower Siren (to detect blower malfunction or other loss of air) and ASTM-approved, 2" thick, non-slip safety/landing mats (to create a safer area around the entrances/exits of your bounce house rental), as well as 18" stakes to properly anchor your bounce house rental - all free of charge! While we do our best to source the safest inflatable rentals, slips, trips and falls can occur, especially without proper supervision to ensure all Inflatable Safety & Operating Instructions are followed at all times. Our flat fee of $19 includes delivery, professional setup and tear-down of your party rentals in Birmingham, Bloomfield Hills, Bloomfield Twp, Canton, Commerce Twp, Dearborn, Dearborn Heights, Farmington, Farmington Hills, Franklin, Garden City, Huntington Woods, Inkster, Lathrup Village, Livonia, New Hudson, Northville, Novi, Oak Park, Orchard Lake, Pleasant Ridge, Plymouth, Redford, Salem, South Lyon, Southfield, Walled Lake, Wayne, West Bloomfield, Westland, Wixom, and Wolverine Lake.